Connected cars, like Tesla’s vehicles, are the latest fashionable device for hackers to crack. As we’ve previously discussed, if done right this is actually making the vehicles safer, but we need to walk the line between that and fear-mongering very carefully. Connected cars are often talked about for their potential vulnerabilities to hackers. The idea that someone could cause an accident by remotely veering your car off the road or applying the brakes is terrifying, but so far the risk has been fairly limited. As a flagship “connected car”, the Tesla Model S has been a constant target for hackers. Some have demonstrated being able to take control of the vehicle, but only through a physical connection to the car, which is not very different from any car-jacking by “hot-wiring” the vehicle. As you probably know, Tesla blocks video playback on the Model S touchscreen and it has yet to enable app mirroring, a feature owners have been waiting for a while and that was announced for a release this summer. Yet, it doesn’t stop some hackers to try bypass Tesla’s system and implement some of those features (to a certain level) themselves. 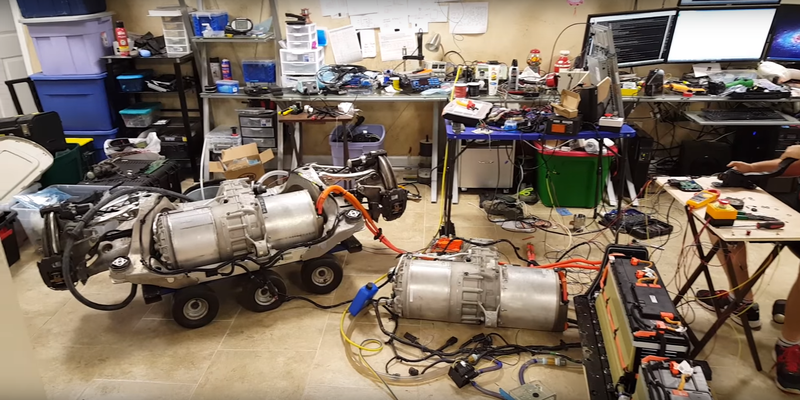 When Jason Hughes, best known as the ‘Tesla Hacker’ who first spotted the upcoming 100 kWh battery pack in the Model S’ OS, retrofitted a classic Tesla Model S P85 with an entire Autopilot hardware suite, something Tesla itself refuses to do because of the cost and complexity, we thought we just witnessed the apogee of his ‘Tesla hardware hacking’ experiments, but we were so very wrong.